Early onset scoliosis (EOS) is deformity of the spine below the age of 5 years. Children with EOS are at risk of impaired thoracic cage development and pulmonary maturation. Initial evaluation consists of determining the etiological cause for EOS, i.e., congenital, neurogenic, idiopathic, or syndromic. The advent of magnetic resonance imaging in recent times has lead to increased awareness of neurogenic causes leading to EOS. Evaluation of spinal cord anomalies in EOS is very important as early diagnosis and treatment can help in deformity stabilization and regression. Also, any surgical or nonsurgical intervention to correct the deformity without prior treatment of spinal cord anomalies can lead to disastrous neurological complications. The scoliotic deformity as described by scoliosis research society has been divided into three types depending on the age of the patients: infantile(0–3 years), juvenile(4–9 years), and adolescent (above 10 years). This definition focuses more on the spinal deformity rather than considering development of thoracic cavity as whole. This classifications indicated the three phases of development of the child. However, the growth of a child is maximum during the infancy and adolescent during which maximum deformities are seen and deformities during juvenile period is rare. The term early onset scoliosis (EOS) was coined by Dickson, which he defined as scoliotic deformity before the age of 5 years. EOS can be idiopathic, syndromic, neurogenic, and congenital. The term EOS focuses more on complete physiological development of thoracic cavity rather than on the magnitude of scoliotic curve. The development of thoracic cavity including lung parenchyma, rib cage, and spine is closely related to each other. During the first 5 years of life, the growth of spine from T1 to S1 is rapid at an average rate of 2cm/year (10cm in first 5 years of life). In the next 5 years, from 5 to 10 years of age, the growth slows down to an average of 1cm/year. After the age of 10 years to adulthood, the growth rate again increases to an average of 2cm/year. Children with scoliotic deformity are at greatest risk of curve progression during the two growth spurt, i.e., during first 5 years of life and during adolescent. During the embryonic growth, the development of spine occurs during 5th to 8th week of gestation. The development of vertebral column and spinal cord is closely related to each other. Any insult to fetal development during this period can lead to congenital spinal deformities along with intraspinal anomalies.,, Intraspinal anomalies are seen in approximately 20%–50% of patients presenting with congenital scoliosis. Before the advent of magnetic resonance imaging (MRI), myelography was the tool for diagnosis with an incidence rate of 5%–18%. Timely diagnosis of this associated condition is important to prevent neurological deterioration and deformity progression. The examination of respiratory system is also important. The examination of respiratory system begins with inspection to look for respiratory rate, movement of air within each hemithorax, associated wheezing, any areas of restricted air movement, and use of accessory muscle of respiration to diagnose increased work of breathing.,Auscultation should be performed to evaluate presence of murmur and movement of air within the lung cavity. The radiographic investigation consists of whole-spine X-ray from C7 to pelvis in anteroposterior (AP) and lateral planes. The AP X-ray is used to assess the magnitude of deformity by Cobbs angle. Bending films can also be used to assess the flexibility of the spine. Standing films are always preferred over supine films to assess the effect of gravity on the deformity. The lung capacity can be indirectly assessed by evaluating the thoracic deformity AP X-ray. On AP X-ray, space available for lung (SAL) can be calculated by taking the ratio height of concave hemithorax with respect to height of convex hemithorax. The SAL is used to measure the restriction of lung growth due to thoracic wall deformity.,,Risser grade should be seen on AP X-ray to evaluate the amount of growth remaining in particular child. The AP X-ray is also used to calculate the rib vertebral angle difference as described by Mehta. Apart from scoliosis, other vertebral defects can be noted on X-ray such as anomalies of vertebral bodies (hemivertebra, unsegmented bar, block vertebra, wedge vertebra, etc. ), dysplastic pedicles, and lamina. An MRI should always be carried out in all patients presenting with EOS as the incidence of intraspinal anomalies in various studies was 18.3%–47%.,,[24-33] Any intervention to correct the spinal deformity in presence of spinal cord anomalies can lead to disastrous neurological deterioration. The cause of scoliosis in children with TC is ischemic injury to the spinal cord, leading to abnormal paravertebral muscle tone and dysfunctioning of sensory system [Figure 1]. Scoliosis can be presenting symptom in 25% of patients with TCS. The aim of tethered cord release (TCR) in patients with congenital spinal deformity is to prevent deformity progression as well as to stabilize the neurological deficit and prevent further deterioration. The risk of deformity progression after dethering depends on the age of presentation of patient (Risser grade) and the angle of deformity (Cobbs angle). Patients with Cobbs angle >40° and Risser grade 0–2 have maximum chances of curve progression. McGirt et al. in their study on effect of TCR on scoliosis showed that patients with Cobbs angle <40° have 5.9 times less chances of curve progression as compared to patients with cob angle >40°. Also the risk of curve progression is 3.4 times less in patients with Risser grade 3–4 as compared to patients with Risser grade 0–2. They also concluded that the risk of curve progression in patients with both the risk factor, i.e., Cobbs angle >40° and Risser grade 0–2 is 100% and risk factor for curve progression in patients with Cobbs angle <40° and Risser grade 3–4 is none. McLone et al. in their study on effect of curve progression in scoliosis after TCR secondary to meningomyelocele showed that the curve improved in 21% patients and was stabilized in 42% patients with Cobbs angle <40° after a follow-up duration of 2–4 years. SSCM is more commonly seen in females as compared to males and type I is more common than type II. Patients with diastematomyelia also show cutaneous abnormalities such as hairy patch over lumbosacral area, cavernous hemangioma, dermal sinus, and dimple. Scoliotic deformity is seen in 30%–79% of the patients with diastematomyelia. Other orthopedic deformities include gait abnormalities and foot deformities. Neurological insult can lead to weakness in lower limbs, spasticity, abnormal reflexes, sensory deficits, and bladder and bowel incontinence. Neurological deterioration in SSCM is due to low anatomical position of the spinal cord, which is fixed by abnormal spur that restricts the normal ascend of the cord during growth leading to stretch induced injury to the cord [Figure 2]. Herniation of posterior fossa contents through the foramen magnum leads to mechanical obstruction of cerebrospinal fluid (CSF) flow leading to formation of syrinx with the spinal canal. Syrinx is a condition in which there is fluid-filled cavity in the parenchyma of spinal cord in rostrocaudal axis.,Mechanical blockage to the CSF circulation within the subarachnoid space at foramen magnum or within the spinal cord is the main cause.,Syrinx is seen in 50–75% of patients with ACM type 1. The syrinx in these patients is seen at the lower cervical and upper thoracic level with a normal spinal cord between the herniated fourth ventricle and syrinx. Suboccipital decompression relieves the anatomical and physiological block of the CSF flow across the foramen magnum resulting in pulsatile flow of CSF and decrease in syrinx size. The surgical procedure aims at increasing the posterior fossa volume. Suboccipital decompression consists of removal of occipital bone and posterior arch of C1. In more aggressive approach the dural sac is opened to release the adhesion and duraplasty is performed. Various studies in literature had shown decompression of cerebellar tonsils in ACM helps in stabilization and regression of the curve. Brockmeyer et al. in their study showed improvement of curve after suboccipital decompression in 62% of patients. Sengupta et al. showed curve improvement after suboccipital decompression in 71.4% of patients. James et al. showed 42% patients did not required spinal fusion after decompression of cerebellar tonsils. However, in some studies the improvement in the curve progression was only temporary. Phillips et al. in retrospective study of four patients showed that neurosurgical drainage had delayed the curve progression but did not completely halt the curve progression. Ghanem et al. studied 12 patients with ACM with syringomyelia. In their study seven patients had associated scoliosis. Neurosurgical decompression helped in stabilization and regression of curve in two patients and progression of curve was seen in five patients. Farley et al. in study of nine patients with ACM and associated scoliosis showed that after neurosurgical decompression, there was temporary stabilization of the curve; however, eight patients showed curve progression at final follow-up, which required spinal fusion. The risk of deformity progression after suboccipital decompression depends on age of the patients, Cobb’s angle, and rotation of the vertebra. The risk of curve progression is less in younger children below 8–10 years of age, Cobb’s angle less than 50°, and nonstructural curves. The risk of curve progression is high in patients older than 10 years, Cobb’s angle more than 50°, structural curves, double major curves, presence of vertebral rotation (perdriolle 2+), and associated kyphosis. No correlation was found between curve progression or regression with respect to gender, neurological deficit at presentation, and frontal balance. In patients with EOS associated with intraspinal anomalies, the surgical intervention for spinal anomalies have shown to improve the curve magnitude in various studies.,Curve regression or curve stabilization after surgical intervention for intraspinal anomalies depends on age of the patients, magnitude and morphology of the curve, Risser grading, and vertebral rotation at the time of presentation. Patients at high risk for curve progression after neurosurgical intervention for intraspinal anomalies include patients with delayed age of presentation after 10 years, Cobb’s angle more than 40°, Risser grade 0–2, vertebral rotation (perdriolle 2+), structural scoliosis, and double major curves.,These high-risk patients can be considered for simultaneous neurosurgical intervention and deformity correction with growth friendly implants. In recent literature, various studies have been published where simultaneous surgical intervention was performed for intraspinal anomalies and spinal deformity with good correction rate and minimum complication rates. Jon et al. in their study showed that TCR and deformity correction can be safely performed in patients with EOS. Neurosurgical monitoring has helped in performing these complex surgeries along with reducing the complication rates. Simultaneous surgeries help to avoid the risk of repeated anesthesia and cost of repeated hospitalization; to reduce the complications of revision surgeries such as dural leaks, increased blood loss, and neurological deficits; and also decrease the rehabilitation and recuperation time.,Patients with low risk for deformity progression after neurosurgical intervention can be kept under routine observation, and instrumented fixation can be considered only if deformity progresses. With the advent of MRI, there has been increasing awareness among surgeons of neurological causes leading to spinal deformity. EOS with spinal cord anomalies is formidable challenge to surgeons as this associated condition can lead to long-term morbidity. Recent advances in the surgical and nonsurgical techniques for deformity corrections in EOS and importance of development of thoracic cage has helped in reduction of long-term morbidity. Early diagnosis and treatment of this associated pathology helps to avoid neurological deterioration and improve scoliosis outcome. Nicholas DF, Robert WB. Early onset scoliosis: current concepts and controversies. Curr Rev Musculoskelet Med 2012;13:102-10. Pahys JM, Samdani AF, Betz RR. Intraspinal anomalies in infantile idiopathic scoliosis: prevalence and role of magnetic resonance imaging. Spine (Phila Pa 1976) 2009;13:E434-8. Dickson RA. Early onset idiopathic scoliosis. In: Weinstein LS, editor. The paediatric spine: principles and practice. Philadelphia (PA):Lippincott Williams and Wilkins; 2001. pp. 321-8. Yang S, Andras LM, Redding GJ, Skaggs DL. Early-onset scoliosis: a review of history, current treatment, and future directions. Pediatrics 2016;13:e20150709. John TE, Lawrence IK, Behrooz AA. Early onset scoliosis: modern treatment and results. J Pediatr Orthop 2012;13:647-57. Robert JT, John RF, Caleb JB, James OS. Nonsurgical Management of early-onset scoliosis. J Am Acad Orthop Surg 2015;13:519-28. Mehta MH. The rib-vertebra angle in the early diagnosis between resolving and progressive infantile scoliosis. J Bone Joint Surg Br 1972;13:230-43. Campbell RM Jr, Smith MD, Mayes TC, Mangos JA, Willey-Courand DB, Kose N, et al. The characteristics of thoracic insufficiency syndrome associated with fused ribs and congenital scoliosis. J Bone Joint Surg Am 2003;13:399-408. Yong-tai L, Li-lin G, Zhuang T, Wen-ling Z, Bin Yu, Shu-yang Z, et al. A retrospective study of congenital scoliosis and associated cardiac and intraspinal abnormities in a Chinese population. Eur Spine J 2011;13:2111-4. Neeraj G, Rajasekaran S, Balamurali G, Ajoy S. Vertebral and intraspinal anomalies in Indian population with congenital scoliosis: a study of 119 consecutive patients. Asian Spine J 2016;13:276-81. Arlet V, Odent T, Aebi M. Congenital scoliosis. Eur Spine J 2003;13:456-63. Togay K, Khai SL, John KW. Are intraspinal anomalies in early onset idiopathic scoliosis as common as once thought? A two centre United Kingdom study. Eur Spine J 2013;13:1250-4. Mario C, Robert FK. Neurosurgical management of spinal dysraphism and neurogenic scoliosis. Spine 2009;13:1775-82. McMaster MJ. Occult intraspinal anomalies and congenital scoliosis. J Bone Joint Surg Am 1984;13:588-601. Basu PS, Elsebaie H, Noordeen MH. Congenital spinal deformity: a comprehensive assessment at presentation. Spine (Phila Pa 1976) 2002;13:2255-9. Phuong LK, Schoeberl KA, Raffel C. Natural history of tethered cord in patients with meningomyelocele. Neurosurgery 2002;13:989-93; discussion 993-5. Hertzler DA 2nd, DePowell JJ, Stevenson CB, Mangano FT. Tethered cord syndrome: a review of the literature from embryology to adult presentation. Neurosurg Focus 2010;13:E1. Lew SM, Kothbauer KF. Tethered cord syndrome: an updated review. Pediatr Neurosurg 2007;13:236-48. Joseph AJ, Benjamin A. Scoliosis: review of diagnosis and treatment. Paediatr Child Health 2007;13:771-6. Chun EM, Suh SW, Modi HN, Kang EY, Hong SJ, Song HR. The change in ratio of convex and concave lung volume in adolescent idiopathic scoliosis: a 3D CT scan based cross sectional study of effect of severity of curve on convex and concave lung volumes in 99 cases. Eur Spine J 2008;13:224-9. Theofanis T, Theodoros G. Pulmonary function in children with idiopathic scoliosis. Scoliosis 2012;13:7. Jacques HH, Seth SL. In brief: The Risser Classification: a classic tool for the clinician treating adolescent idiopathic scoliosis. Clin Orthop Relat Res 2012;13:2335-8. Bui CJ, Tubbs RS, Oakes WJ. Tethered cord syndrome in children: a review. Neurosurg Focus 2007;13:E2. Bernard TN Jr, Burke SW, Johnston CE 3rd, Roberts JM. Congenital spine deformities. A review of 47 cases. Orthopedics 1985;13:777-83. Bradford DS, Heithoff KB, Cohen M. Intraspinal abnormalities and congenital spine deformities: a radiographic and MRI study. J Pediatr Orthop 1991;13:36-41. Prahinski JR, Polly DW Jr, McHale KA, Ellenbogen RG. Occult intraspinal anomalies in congenital scoliosis. J Pediatr Orthop 2000;13:59-63. Suh SW, Sarwark JF, Vora A, Huang BK. Evaluating congenital spine deformities for intraspinal anomalies with magnetic resonance imaging. J Pediatr Orthop 2001;13:525-31. Dobbs MB, Lenke LG, Szymanski DA, Morcuende JA, Weinstein SL, Bridwell KH, et al. Prevalence of neural axis abnormalities in patients with infantile idiopathic scoliosis. J Bone Joint Surg Am 2002;13:2230-4. Mohammad AE, Mohammad SG, Ebrahim A, Hamid N, Saeid S. Occult intraspinal abnormalities and congenital scoliosis. JRMS 2007;13:53-7. Gerard B, Franck L, Pierre LD, Elke V, Jean LJ. Congenital abnormalities associated with hemivertebrae in relation to hemivertebrae location. J Pediatr Orthop B 2010;13:90-4. Shen J, Wang Z, Liu J, Xue X, Qiu G. Abnormalities associated with congenital scoliosis: a retrospective study of 226 Chinese surgical cases. Spine (Phila Pa 1976) 2013;13:814-8. Wen Z, Shifu S, Leilei X, Zhen L, Yong Q, Zezhang Z. The prevalence of intraspinal anomalies in infantile and juvenile patients with “presumed idiopathic” scoliosis: a MRI-based analysis of 504 patients. Musculoskeletal Disorders 2016;13:189. Arvind J, Pankaj K, Ankur G. Early onset scoliosis with intraspinal anomalies: management with growing rod. Eur Spine J 2016;13:3301-7. Caubet JF, Emans JB, Smith JT, Vanbosse H, Ramirez N, Flynn J, et al. Increased hemoglobin levels in patients with early onset scoliosis: prevalence and effect of a treatment with vertical expandable prosthetic titanium rib (VEPTR). Spine (Phila Pa 1976) 2009;13:2534-6. Striegl A, Chen ML, Kifle Y, Song K, Redding G. Sleep-disordered breathing in children with thoracic insufficiency syndrome. Pediatr Pulmonol 2010;13:469-74. Gregory R, Kit S, Steve I, Eric E, Robert C. Lung function asymmetry in children with congenital and infantile scoliosis.The Spine Journal 2008;13:639-44. Schneider SJ, Rosenthal AD, Greenberg BM, Danto J. A preliminary report on the use of laser-doppler flowmetry during tethered spinal cord release. Neurosurgery 1993;13:214-7; discussion 217-8. Daryl EW. Tethered cord syndrome and occult spinal dysraphism. Neurosurg Focus 2001;13;1-9. Yamada S, Iacono RP, Andrade T, Mandybur G, Yamada BS. Pathophysiology of tethered cord syndrome. Neurosurg Clin N Am 1995;13:311-23. Yamada S, Won DJ, Yamada SM. Pathophysiology of tethered cord syndrome: correlation with symptomatology. Neurosurg Focus 2004;13:E6. Khalid LK, Waleed RM, Essam AE, Mustafa AM. Tethered cord syndrome: a study of 35 patients. J Taibah Univ Med Sci 2012:13;23-28. Oakes WJ. The borderlands of the primary tethered cord syndrome. Clin Neurosurg 1996;13:188-202. Iskandar BJ, Oakes WJ: Anomalies of the spine and spinal cord. In: McLone DG, editor. Pediatric neurosurgery: the surgery of the developing nervous system, 4th ed. Philadelphia: WB Saunders; 2001. pp. 307-324. McGirt MJ, Mehta V, Garces-Ambrossi G, Gottfried O, Solakoglu C, Gokaslan ZL, et al. Pediatric tethered cord syndrome: response of scoliosis to untethering procedures. Clinical article. J Neurosurg Pediatr 2009;13:270-4. McLone DG, Herman JM, Gabrieli AP, Dias L. Tethered cord as a cause of scoliosis in children with a myelomeningocele. Pediatr Neurosurg 1990;13:8-13. Pang D, Dias MS, Ahab BM. Split cord malformation: part I: a unified theory of embryogenesis for double spinal cord malformations. Neurosurgery 1992;13:451-80. Pang D. Split cord malformation: part II: clinical syndrome. Neurosurgery 1992;13:481-500. Yusuf E, Saffet M, Sevgul K, Eren D. Split spinal cord malformations in children. J Neurosurg 1998;13:57-65. Miller A, Guille JT, Bowen JR. Evaluation and treatment of diastematomyelia. J Bone Joint Surg Am 1993;13:1308-17. Cheng B, Li FT, Lin L. Diastematomyelia: a retrospective review of 138 patients. J Bone Joint Surg Br 2012;13:365-72. Liu W, Zheng D, Cui S, Zhang C, Liu Y, Jia Y, et al. Characteristics of osseous septum of split cord malformation in patients presenting with scoliosis: a retrospective study of 48 cases. Pediatr Neurosurg 2009;13:350-3. Hankinson TC, Klimo P Jr, Feldstein NA, Anderson RC, Brockmeyer D. Chiari malformations, syringohydromyelia and scoliosis. Neurosurg Clin N Am 2007;13:549-68. Milhorat TH, Nishikawa M, Kula RW, Dlugacz YD. Mechanisms of cerebellar tonsil herniation in patients with Chiari malformations as guide to clinical management. Acta Neurochir (Wien) 2010;13:1117-27. McGirt MJ, Atiba A, Attenello FJ, Wasserman BA, Datoo G, Gathinji M, et al. Correlation of hindbrain CSF flow and outcome after surgical decompression for Chiari I malformation. Childs Nerv Syst 2008;13:833-40. Jingming X, Yingsong W, Zhi Z, Ying Z, Yongyu S, Zhendong Y, et al. One-stage and posterior approach for correction of moderate to severe scoliosis in adolescents associated with Chiari I malformation: is a prior suboccipital decompression always necessary? Eur Spine J 2011; 13:1106-13. Heiss JD, Patronas N, DeVroom HL, Shawker T, Ennis R, Kammerer W, et al. Elucidating the pathophysiology of syringomyelia. J Neurosurg 1999;13:553-62. Tao W, Zezhang Z, Jian J, Xin Z, Xu S, Bangping Q, et al. Syrinx resolution after posterior fossa decompression in patients with scoliosis secondary to Chiari malformation type I. Eur Spine J 2012;13:1143-50. Emery E, Redondo A, Rey A. Syringomyelia and Arnold Chiari in scoliosis initially classified as idiopathic: experience with 25 patients. Eur Spine J 1997;13:158-62. Tubbs RS, Lyerly MJ, Loukas M, Shoja MM, Oakes WJ. The pediatric Chiari I malformation: a review. Childs Nerv Syst 2007;13:1239-50. Brockmeyer D, Gollogly S, Smith JT. Scoliosis associated with Chiari 1 malformations: the effect of suboccipital decompression on scoliosis curve progression: a preliminary study. Spine (Phila Pa 1976) 2003;13:2505-9. Sengupta DK, Dorgan J, Findlay GF. Can hindbrain decompression for syringomyelia lead to regression of scoliosis? Eur Spine J 2000;13:198-201. James ME, Mark AE, Michael FO, Michael H. Chiari I malformation associated with syringomyelia and scoliosis. Spine 2002;13:1451-5. Phillips WA, Hensinger RN, Kling TF Jr. Management of scoliosis due to syringomyelia in childhood and adolescence. J Pediatr Orthop 1990;13:351-4. Ghanem IB, Londono C, Delalande O, Dubousset JF. Chiari I malformation associated with syringomyelia and scoliosis. Spine (Phila Pa 1976) 1997;13:1313-7; discussion 1318. Farley FA, Song KM, Birch JG, Browne R. Syringomyelia and scoliosis in children. J Pediatr Orthop 1995;13:187-92. Flynn JM, Sodha S, Lou JE, Aadms SB Jr, Whitefield B, Ecker ML, et al. 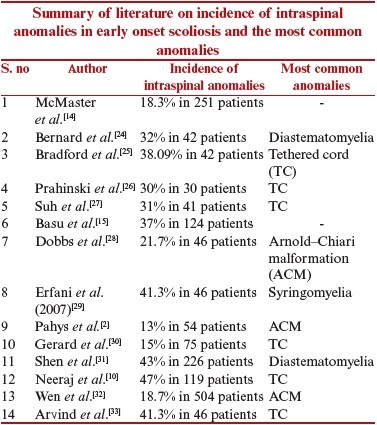 Predictors of progression of scoliosis after decompression of an Arnold Chiari I malformation. Spine 2004;13:286-92. Dimeglio A, Bonnel F, Canavese F: Normal growth of the spine and thorax. In: Akbarnia BA, Yazici M, Thompson GH, editors. The growing spine. New York: Springer; 2011. pp. 13-42. Lattig F, Taurman R, Hell AK. Treatment of early-onset spinal deformity (EOSD) with VEPTR: A challenge for the final correction spondylodesis-A case series. Clin Spine Surg 2016;13:E246-51. Konieczny MR, Ehrlich AK, Krauspe R. Vertical expandable prosthetic titanium ribs (VEPTR) in early-onset scoliosis: impact on thoracic compliance and sagittal balance. J Child Orthop 2017;13:42-8. Pierz K, Banta J, Thomson J, Gahm N, Hartford J. The effect of tethered cord release on scoliosis in myelomeningocele. J Pediatr Orthop 2000;13:362-5. Reigel DH, Tchernoukha K, Bazmi B, Kortyna R, Rotenstein D. Change in spinal curvature following release of tethered spinal cord associated with spina bifida. Pediatr Neurosurg 1994;13:30-42. Jon EO, Suken AS, William GM. Concurrent tethered cord release and growing-rod implantation—is it safe? Global Spine J 2012;13:207-12. Vivek AM, Oren NG, Matthew JM, Gokaslan ZL, Edwards SA, George IJ. Safety and efficacy of concurrent pediatric spinal cord untethering and deformity correction. J Spinal Disord Tech 2011;13:401-5. Azmi H, Cagatay O, Mehmet T, Mehmet A, Mercan S, Ufuk T. Simultaneous surgical treatment in congenital scoliosis and/or kyphosis associated with intraspinal abnormalities. Spine 2007;13:2880-4.